We already know West Coast designer Betsy Burnham is an ace at mixing old with new, high with not-so-high, and serious with lighthearted. 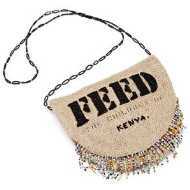 But I was curious about some of her first personal buys -- pieces she felt had proven to be great investments. She says she has quite a few favorite antique and vintage items. But if forced to mention only one, it might be her son Will's faux bamboo bed found almost ten years ago at Tod Carson's in L.A.
Back then, Will was graduating out of his crib and "There was no way I was going to buy anything typical or toddler-esque," explains Burnham, "so I found this gorgeous vintage piece, which was a lot of money for me at the time, was an odd size (we had to have a mattress custom made because it’s a 'european twin' -- somewhere between a twin and a full) and was admittedly sort of precious. " Still, Burnham adds, "I’ve never fretted much about form versus function, because a lot of the things I like are vintage or antique. My philosophy is just to enjoy them and use them as much as possible in everyday life. So the bed was a purchase I’ve never regretted. Will is still sleeping in it, and maybe he can even give it to one of his kids one day." 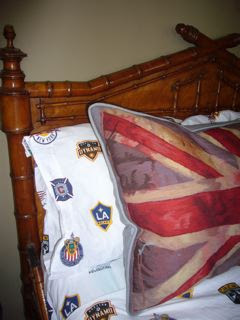 No snob, Burnham is fine with the Pottery Barn Kids sheets that happen to be on young Will's bed at the moment. These faux bamboo beds are certainly classics. Not too long ago, San Francisco garden designer Robyn Pope acquired one for her daughter. The example shown above top is a 19th century French piece available through Lauren Copen. 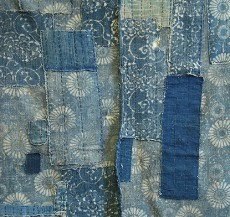 Blue, an exhibition that looks at the meaning of indigo hues on textiles, continues at the Textile Museum through September. 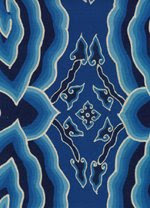 Included are blue textiles ranging from Greco-Roman and pre-Columbian tunic fragments to contemporary creations. 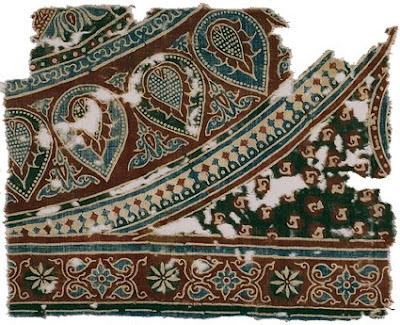 Shown top, a cotton fragment from India, possibly 17th century. Shown second, a 20th century Chinese-Indonesian cloth. Here's a little Thursday treat: Anne Coyle has updated her site with new projects. 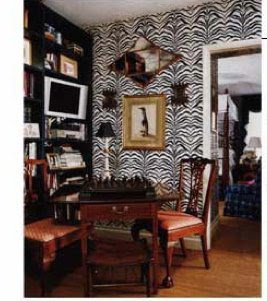 I think you will notice her signature use of lavender (she was ahead of the curve on that) as well as her beloved black-and-white graphic stripes (zebra and vertical). 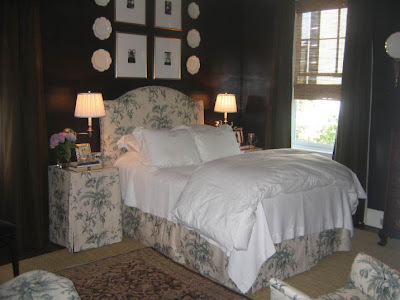 The interiors are timeless but, as always, youthful and glamorous. 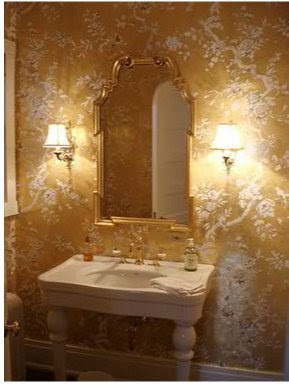 I'm coveting the powder room above. Sometimes the influence of Frédéric Méchiche's work can be seen in Coyles' projects. 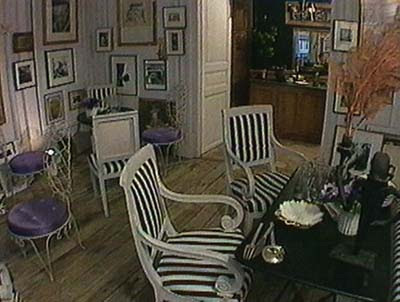 Above, stripes in a bath at the Méchiche-designed Hotel Le A.
Méchiche's dining room, circa 1996. Image via CNN. 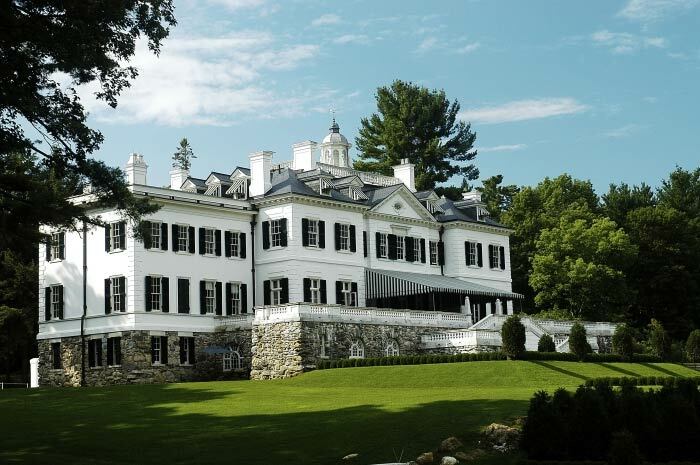 For the past few weeks I've mentioned at the close of some posts that Edith Wharton's former Massachusetts home, The Mount, is facing immediate foreclosure. 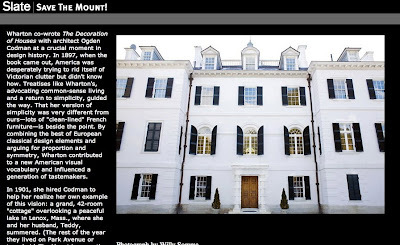 Always resourceful Meg just sent me a link to an excellent Slate article that covers Wharton's residence in detail -- its place in design history, why it is relevant today. Brilliant slides accompany the story too. The 18th century had celebrity couples too. It seems London's most fashionable was actor David Garrick and his wife Eva. Like the rest of their chic British peers, the couple craved chintz imported from India (originally a hand-drawn, resist-dyed cotton). 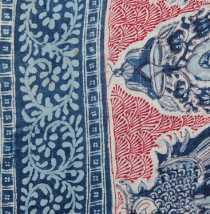 Notes Rosemary Crill in Chintz: Indian Textiles for the West, this fresh, lightweight, exotic fabric caused such a sensation in Europe that traditional English weavers faced financial jeopardy. In response the British government imposed a ban on chintz, but the fashionable crowd continued to buy it from smugglers. The Indian chintz shown at top, bought by David and Eva, was initially confiscated by customs officials. Apparently though, the performers' clout enabled them to get back their precious fabric because it was hung on their Chippendale-made four-poster bed, and today belongs to the V & A. 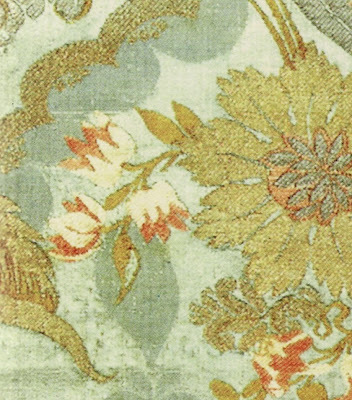 The second image above shows a detail of a 17th century cotton bed cover imported from the Coromandel Coast. Here animals and flora associated with China and India have been interpreted for a Western audience. To learn more see Crill's book. 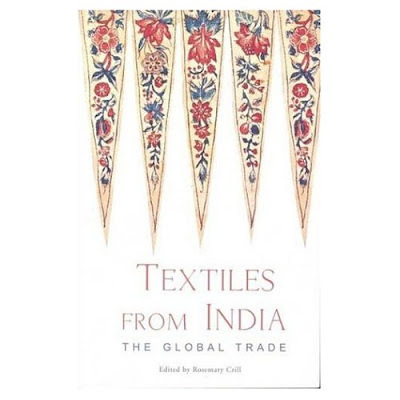 All images copyright the V & A.
I'm thinking of adding another Crill title to my library, Textiles from India: The Global Trade. Does anyone already own it? 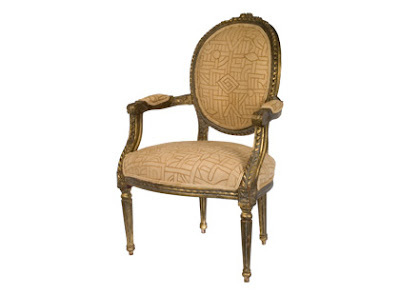 Do you think David Hicks -- or India Hicks -- would like this chair? 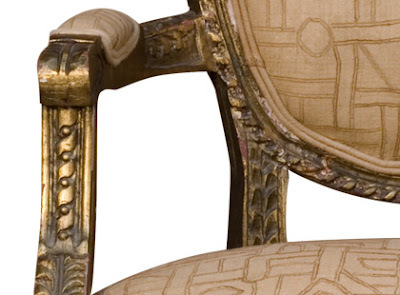 The unexpected African Kuba cloth on the antique French gilt chair reminds me of the Hicks family. 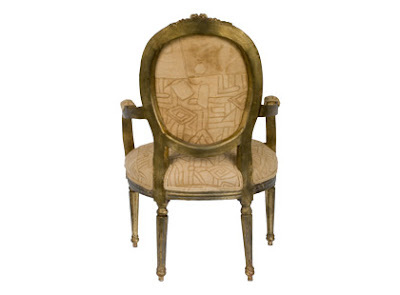 It's part of the vintage collection offered by Chicago's Jayson Home. Yesterday Jayson opened its European Flea Market, scheduled to continue through April 20. Online shopping begins April 25. In high school I was encouraged by a brilliant teacher to read more Wharton. "Her vivid imagery, her visual nature, and her passion for houses will appeal to you," the teacher said. I never forgot the advice, and I recently began reading the new reprint of Edith Wharton's 1904 book, Italian Villas and Their Gardens. It includes numerous lovely illustrations by Maxfield Parrish -- art that apparently frustrated Wharton because she deemed it to be too disconnected from her text. (Parrish refused to travel with her or collaborate.) But critics think Wharton's descriptions steal the show. It's a bit like a travel book, although Wharton shares no details on how to find the gardens. And it is not a practical gardening manual. Really the focus is what Wharton calls "garden-magic." The beautiful relationship between those not-so-flowery Italian gardens, historic houses, and art. She explores in great detail villas throughout the country -- Florence, Rome, Genoa, Lake Como, Siena. Residences surrounded by "enchanting" clipped greenery and stone. The 1904 edition was published without a dust jacket, so, true to Wharton's interest in decoration, an Italian 18th century brocade was used as background for the reissue jacket. 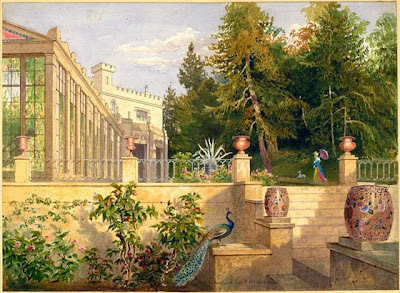 Originally, a portion of the proceeds from sales of this edition were slated for ongoing restoration of Wharton's beloved Massachusetts estate, The Mount. Unfortunately, The Mount is now facing foreclosure. A blog has been established as part of the Save The Mount Campaign. I can deal with small spaces, but I do dream of more bookshelves. 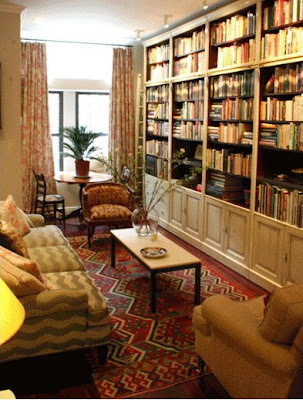 Specifically, a library-living room like the narrow but stylishly laid-back Rayman Boozer-designed example here. 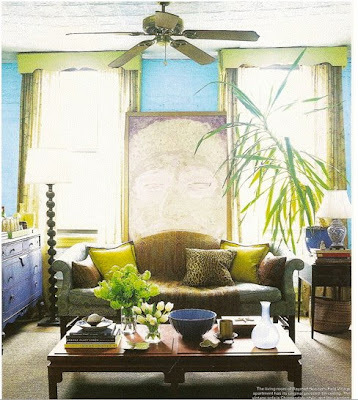 Remember when Boozer's own apartment made the May 2006 cover of Elle Decor? (Blue interior above.) It was an inspirational issue for everyone who dwells in cramped or modest quarters. Boozer really excels at working with those classics we've been talking about this week -- camel back sofas, trad brown chests, Chinese export lamps. Often he spices them up by placing them in vibrantly colored rooms with great textiles. Check out his online portfolio to see more. Here's designer Mallory Mathison's first antique -- the chic walnut bachelor's chest with fretwork detail discussed earlier -- serving double duty as a bar. Note the cool lamps. What a great first investment.
" 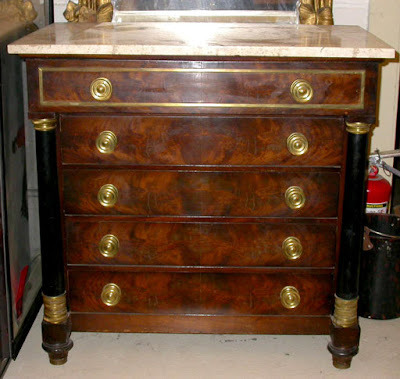 A walnut bachelor's chest (with fabulous fretwork inlay -- so delightful!). It has been a dream! It has been a bedside table, sideboard, TV chest and bar, and has worked beautifully in every capacity. 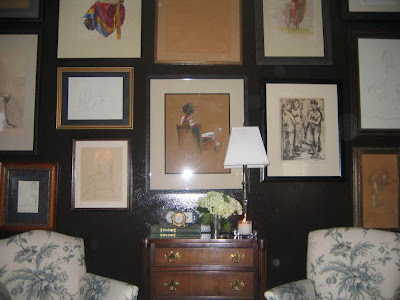 When you are looking for your first "investment" type antique, whether it is a steal of a deal at an estate sale or a special purchase from a high-end shop, look for something that can be wonderfully useful in a multitude of ways as well as beautiful to look at!" 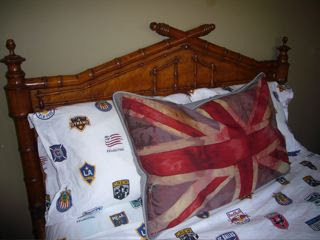 We've already talked about Mathison's mix of feminine and masculine elements in her own bedroom. 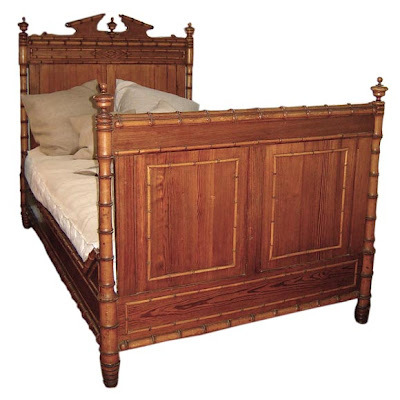 Sheraton-style chest shown top is available through Georgia Creek. 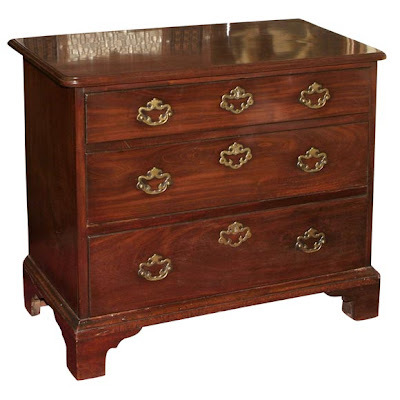 Georgian chest, image three, is available through Antiquario. 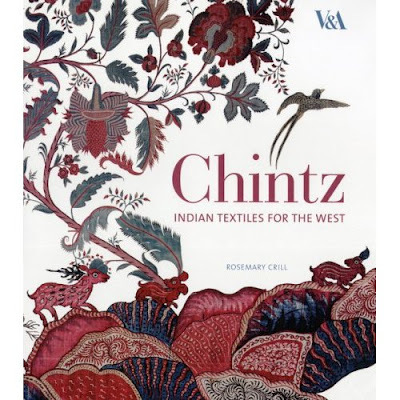 I have to say, I'm embarrassed it has taken me this long to mention Chintz: Indian Textiles for the West, a new title from Rosemary Crill, senior curator in the V & A's Asian Department. 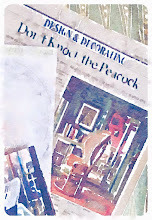 It was the nice feature on Achivia Books, in the latest House Beautiful, that jogged my memory. 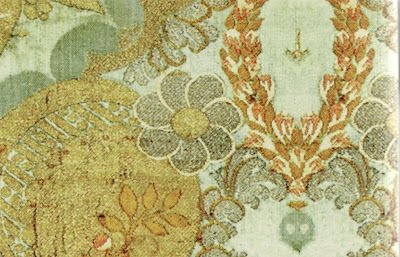 Click here for more on the V & A's textile collection. The book is also available here. 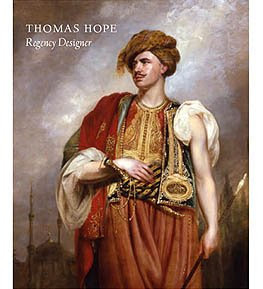 Also of interest, the V & A's exhibition, Thomas Hope: Regency Designer. For nearly two years now, Kelly Wearstler's commercial projects have been a popular topic on this blog. I think many of us are intrigued by her evolving style, and we take inspiration from her work. So I thought you might enjoy a little update on one of her latest far-flung endeavors, Viceroy Anguilla. Last month she unveiled the resort's model four-bedroom villa on Barnes Bay. (Villas and townhomes are available for purchase as second residences.) As you can see above, the architecture is clean and contemporary, but Wearstler decided to balance this with organic materials and global references. 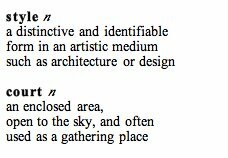 Personally, I'm always fascinated by the connections between her residential and commercial work. Right off the bat, I noticed what I call the "glamorous swing." A piece used outdoors at her own home, the Hillcrest Estate, below, and now at Viceroy Anguilla. 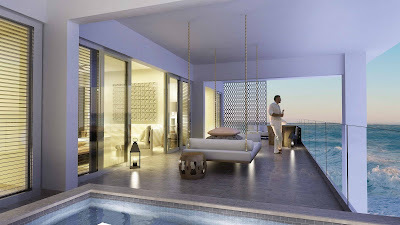 For the full scoop on purchasing one of these appealing island escapes, or to simply see floor plans, visit Viceroy Anguilla. Last week Katie explained to us why she favors antique secretaries as a young collector's first investment. 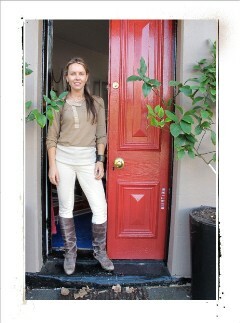 She noted that these versatile pieces can be used almost anywhere, even in a bedroom. Oscar de la Renta must feel the same way. This early 18th century Spanish mother-of-pearl secretary was, according to Sarah Mower's book, a "love-at-first-sight impulse" purchase -- Oscar's first major acquisition -- paid for in installments over 18 months. 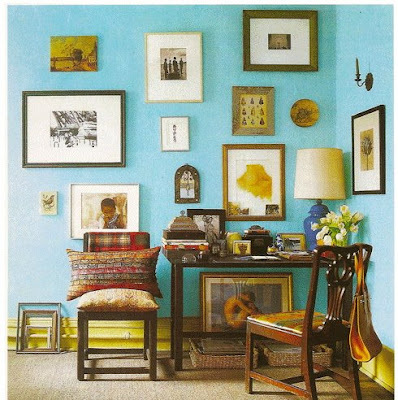 Image is from House Beautiful, June 2002. HB says the secretary is 17th century. Sarah Mower, in her book, Oscar, describes the piece as 18th century. If you've read Angele Parlange's book, Creole Thrift, you've probably enjoyed hearing about her weekend-in-the-country adventures with Mish, when they hunt for antiques not game. 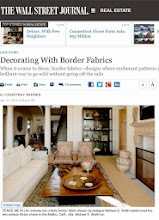 Now the May Elle Decor offers us a nice peek into jewelry designer Mish's charming rustic-meets-chic home (although, if I've been paying attention, it's not the same Northeastern residence Parlange mentions). 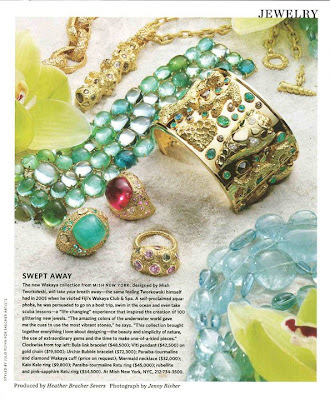 For me, one of the best quotes from the May issue comes from Mish, the former in-house jewelry expert at Sotheby's; he says, "We are collectors at heart, not decorators...the house is furnished with lots of things from previous lives." 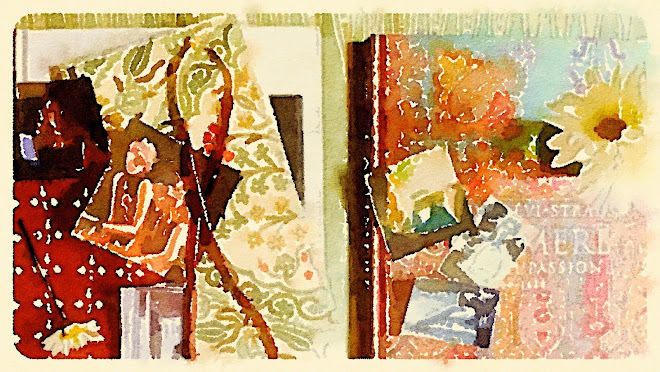 These autobiographical interiors, like the one shown top, usually contain disparate pieces that defy logic by working together. 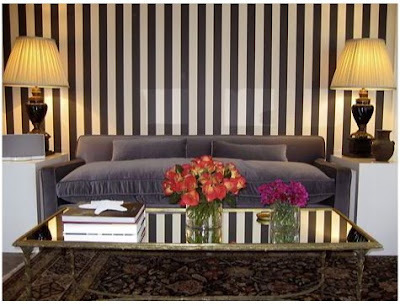 (Look at those topaz-covered Louis XV-style chairs mixed with the informal red striped sofa and oriental rug.) 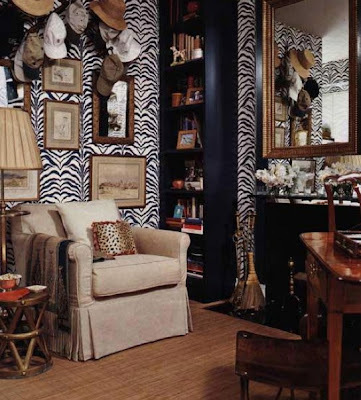 And Elle Decor always seems to hunt down the most sophisticated examples. 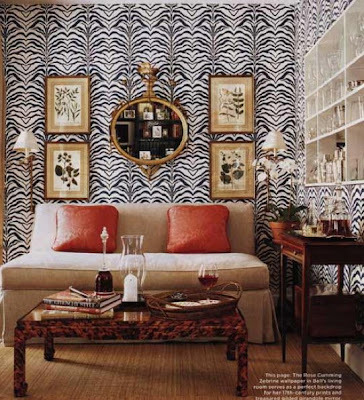 Elle Decor photography by William Waldron. 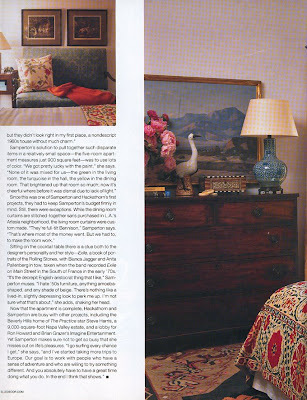 Middle image from Town & Country, April 2008. Bamboo cuffs by Mish.